It’s been crazy cold here lately. Like, freeze your buns off. Bundle up in the warmest jacket. Throw the hugest scarf around your neck. Consume what seems like a thousand cups of hot tea. Feel me? And the cold in Newfoundland is what I like to refer to as ‘damp’ or ‘wet’ so it probably feels colder than it actually is. Naturally, I’ve been making and enjoying a lot of soup. Hands down soup is my favourite thing to make (hint—>I have a lot of soup recipes heading your way over the next few weeks). Today I’m sharing a creamy cauliflower soup. And it’s not just cauliflower. There’s other yummy things, like leek and cheddar. It’ll warm ya to the core! This cauliflower leek soup has some pretty simple ingredients, nothing complicated at all, but tastes absolutely AMAZE BALLS! What gives it an awesome flavour? Well, there’s cheese, of course (if you read this blog, you pretty much know that cheese is my middle name 😉 ) Leeks are pretty awesome too. Then, there’s the roasted cauliflower. I mean, sure, you can go ahead and just boil the cauliflower, but it wouldn’t taste the same. Roasting gives it another element of flavour and when you are working with so few ingredients you want them to shine. I roasted the cauliflower in this recipe as I did here. Leeks are part of the onion family and have a mild onion flavour. Though they add a lovely flavour to recipes, leeks can be oh-so-dirty. Lots of times as they grow, dirt/soil gets in between all those layers. Obviously, that needs to go before using a leek in any recipe. How do you chop and clean leeks? It’s easy! Secondly, carefully cut down the centre of the leek with a knife. Cut the root part off (at the bottom) and the tough (super green) top part (about an inch or so). Then, thinly slice the leek. Place chopped leek in a strainer to thoroughly wash/drain and then use in recipe. You can either use parchment paper on your sheet pan when roasting the cauliflower or not. Keep in mind, though, that parchment paper will make things a little easier clean-up wise. Though, I didn’t use it here. You do you! I highly recommend garnishing with croutons (homemade ones). They’re buttery and fabulous and add a lovely texture to this cauliflower leek soup. For a deadly good crouton recipe, check out here where I made ’em for a salad. For an even richer taste, you can add half and half or heavy cream to this soup instead of whole milk. Whole milk Greek yogurt is lovely too. I used unsalted chicken stock in this soup. However, if you want to keep this soup vegetarian, use unsalted veggie stock. Ensure that the cauliflower florets are spaced out enough on your sheet pan so they roast and not steam (which they will do if the pan is too full). If you need to, use a couple of sheet pans to roast the cauliflower. I used an immersion blender to blitz this soup. If you don’t have, you can use a blender. Just make sure it cools slightly (or can handle the hot soup) before blending. The cheddar cheese is stirred into the soup with a spoon, not blended with an immersion blender. Homemade croutons (to keep things low carb, omit those. Fortunately, I’m on team carbs, so bring it, lol). If you are going with gluten free, use gluten free croutons. This Roasted Cauliflower Leek Soup with Cheddar is rich in savoury flavour and super creamy (without using cream). It's hearty enough to be substantial for lunch or dinner. Don't forget those buttery croutons on top! Cut cauliflower into florets and toss with 1 tbsp olive oil, 1/4 tsp each of salt and pepper. 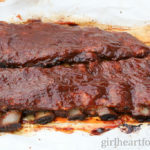 Bake in a 450 F oven on a sheet pan for 25-30 minutes, turning halfway. Carefully remove from oven. Meanwhile, in a dutch oven or medium-sized pot on medium heat add remaining 1 tbsp of olive oil. Add leeks and remaining 3/4 tsp of salt and 1/4 tsp of black pepper. Cook for about 10 minutes, stirring periodically. Add garlic and thyme to leeks and cook 1 minute. To leek mixture add roasted cauliflower and stock. Bring to low simmer, cover ajar and cook 15 minutes. Turn off heat. Using an immersion blender, blend until smooth. Pour in milk. Blend again. If you want a looser soup, blend in a little more stock. Stir in cheddar cheese with spoon until distributed throughout soup. Serve and garnish as desired. Enjoy! You can either use parchment paper on your sheet pan when roasting the cauliflower or not. Keep in mind, though, that parchment paper will make things a little easier clean-up wise. Though, I didn't use it here. You do you! I highly recommend garnishing when croutons (homemade ones). They're buttery and fabulous and add a lovely texture to this cauliflower leek soup. For a deadly good crouton recipe, check out here where I made 'em for a salad. I used an immersion blender to blitz this soup. If you don't have, you can use a blender. Just make sure it cools slightly (or can handle the hot soup) before blending. The cheddar cheese is stirred into the soup, not blended in with the immersion blender. This soup is just what I need as I look out onto the snow that fell yesterday. Nothing like a warm and hearty soup to get through these cold winter days! This is really lovely. Typical one chooses potatoes and leeks, but cauliflower and leeks sound downright perfect! Lovely photos. Thanks so much Mimi 🙂 It’s a yummy combo. I could eat a whole pot of this soup! Cauliflower soup is one I really love, and the addition of leek to this is perfect. Can’t wait to try it! Now if this soup doesn’t warm a person up, not sure what would!?! This soup looks so warm and cozy just like your serving bowls! Awww – thanks so much Kevin! I love the additional flavour you get from roasting the cauliflower. A perfect soup for winter days! I am a bonified soup crazy person and I cannot wait to try your Super Creamy Roasted Cauliflower and Leek Soup, Dawn. I make soup all year around – I cannot help myself! This looks so delicious! I cannot wait to try it. I do too! Love soup! Thank you Denise 🙂 Hope you love it! We’re flying home tomorrow and have snow in the forecast for a week! We clearly need to make this comforting soup. All of the flavors have my mouth watering!! You sure do 😉 Thanks Marissa! Snow is headed our way tomorrow Dawn, so this soup would totally fit the bill! And cauliflower is one of my faves! On the menu here soon! Pinned! It sure would! Thanks Mary Ann! January and February haven’t been too bad here, but it’s been extremely cold for the last couple of days too. Besides low temperatures, we’ve got strong winds and some kind of humidity in the air – things that make any cold weather basically unbearable. Decision? Soup. Correction: A lot of soup! This delicious vegetable soup with the addition of cheddar is what the doctor ordered! Aaah SO cold right!? I’ve basically been living in my blanket scarf these days. 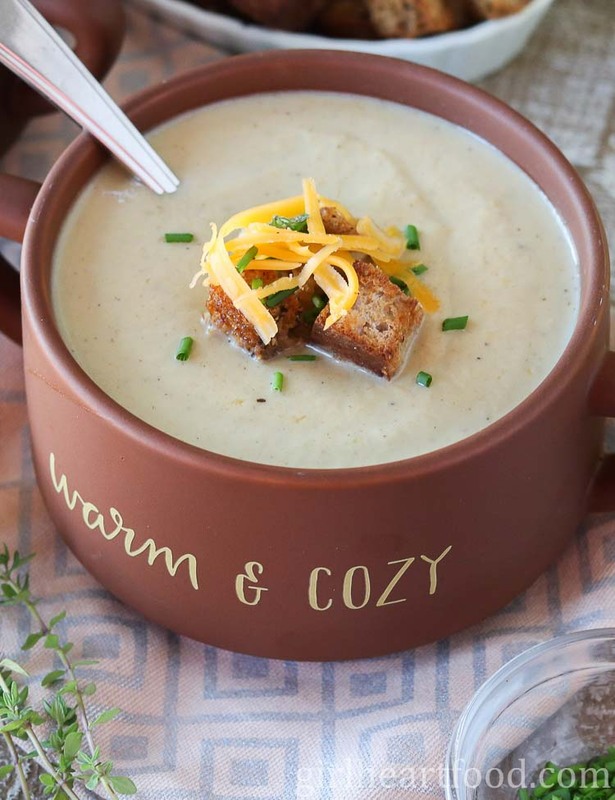 You and I are on the same wavelength with cozy soups! I LOVE cauliflower, and I don’t use leeks enough. I’m definitely going to try this one!! Have a great week, Dawn! I know, I know!! Hope you love it! Thanks Katherine 🙂 You too! I love using leeks! They’re so packed with flavor! This soup looks SO super creamy. I’d love a big bowl of this while I’m snuggled up under a blanket. It’s been chilly here as well…although last week we had 75 degree weather. Ugh, only in the South. Cheers to Spring! Smooth and creamy–this soup is pure velvet! Love that you suggest roasting the cauliflower first. It really does make a difference to the flavour, doesn’t it! Thanks for a great recipe. Dawn – what a lovely soup! I love anything with cauliflower, and so agree, it is way better roasted than boiled! Totally different veggie. This soups looks and sounds amazing and so warming. Perfect given we have about 10” snow today! Dawn, such a lovely soup! I love the cheese – Yay! Roasting really brings out the flavor, doesn’t it? Soups are so cozy this time of year – and they’re so yummy. Your warm and cozy bowls are so cute! Have a great week, my friend! We are on the same page with the soup today Dawn! It’s been so cold and windy here these past few days, I just want to wrap myself in a blanket and eat soup until April! This one looks particularly cozy. Love the flavour that leeks add to soup, and cauliflower is just the best. So creamy! Happy Monday Dawn! “Warm & Cozy” is right! Sounds so delicious and comforting. 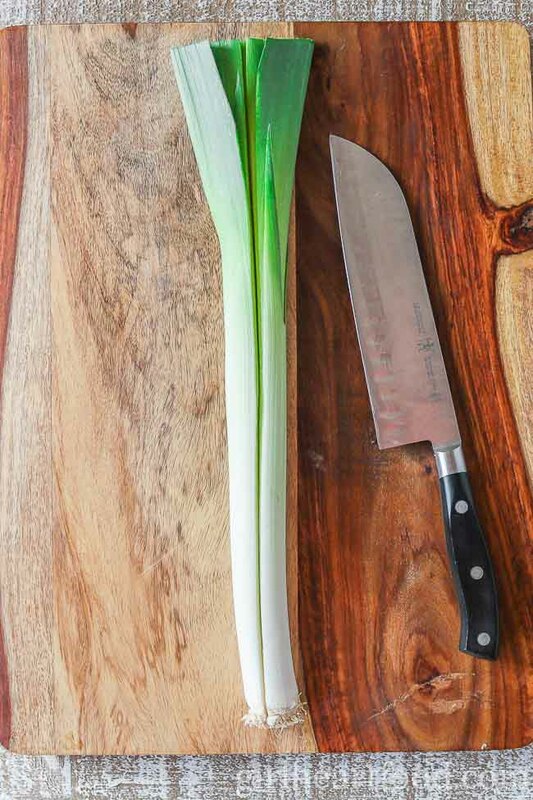 Love the helpful tips for working with leeks, and the photos of them are so pretty. Simple beauty. Thank you very much, Valentina!! Appreciate that! I’m definitely going to try this! I LOVE cauliflower and leeks both, and I love a good bowl of soup. I have a feeling this will become a new favorite :). Have a great week, Dawn! And stay warm! Would love a bowl of this creamy goodness infused with the flavor or roasted cauliflower! BTW I love how you spell ‘savoury flavour’ – I learned British spelling first and it was hard to adjust to American. When I read Canadians’ writing it always feels classier:) As to the cold – same here – after an almost spring like January we finally got cold weather and it has been haaard to survive! Cauliflower leek soup is rightfully in order! Lol…thanks! There are a lot of words the Canadians spell like that – favourite, colour, etc. Hope you stay warm, my friend. Thanks for the kind comment! We’ve had a fairly mild winter until this week! The cold temps and wind finally hit. It’s nothing compared to what you’ve been getting, but enough to make me crave warm cozy foods! This soup is just what I’m needing! Stay warm!!! It’s a good one! Thank you Kathy! Hope you’re having a great weekend.